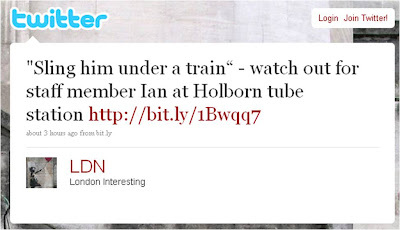 'Ian from Holborn' has become an internet celebrity this morning - but not in a good way. Ian is a London Underground worker and was caught on camera abusing a passenger. The recipient of the abuse was an old man who had apparently been complaining about being trapped in the door of a previous train. This is a great example of people power and citizen journalism. Johnathan's blog post and accompanying video have been linked to, discussed and retweeted across the internet - so much so that 'Holborn' became a Trending Topic on Twitter this morning. 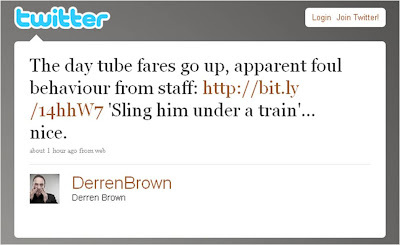 Other Twitter users have posted a link to a Facebook profile that looks like it belongs to 'Ian' (though I think this is probably going over the top) and all this activity has now seen the 'Ian from Holborn' story cross over into national mainstream media, with the Telegraph reporting 'Tube employee says elderly passenger should be 'slung under a train''. Transport for London is a public body and people in London have little alternative to the Tube. However, in private business it is different. We have seen the 'disgusting Domino's employees', wayward staff running amock in ASDA stores and the DSG Employee Facebook group publicly discussing 'stupid customers'. As the 'viral' effects of social media increase the highlighting of poor employee behaviour will become more commonplace and more visible. Tools and offerings are now available to monitor social sites and help companies respond to issues arising from employee conduct and customer service - would you be able to quickly respond to an issue like 'Ian' and prevent it affecting your brand / sales? 2) ian has a ponytail. unacceptable. In his Facebook profile picture no ponytail, Ian is wearing his hair loose. Clearly ponytail is just a thing he does for work. Hope that makes you feel better. I like this blog! It stands out from all the others in this search criteria! I know a great blog when I see it. Thanks for the great information on the subject. The web needs more blogs like this one. Thanks again, and Happy Halloween!